"Kathy, our thoughts & prayer are with you & your family. ..."
and an ever-present sense of humor." 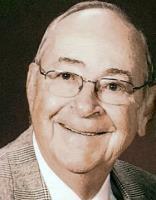 Dennis Voeller, 83, died Dec. 4, 2017, in Vancouver, WA. He was born in Rugby, ND, the oldest child of Joseph and Catherine (Axtman) Voeller. Denny enlisted in the United States Air Force. He served his country during the Korean War, stationed in Labrador. After military service, Denny returned to Vancouver and completed his AA degree at Clark College and went on to earn his Bachelor's degree from the University of Portland. Denny met the love of his life, Kathleen, and married her in 1959. They enjoyed many wonderful adventures together, including 16 cruises around the world. Sadly, he passed just 3 weeks shy of their 58th wedding anniversary. Denny worked for the State of Oregon first at the Employment Division and later at the Adult and Family Services Division in Portland and La Grande, OR. Denny was an avid golfer who achieved 20 holes-in-one. He also enjoyed traveling, gardening, and playing bridge. First and foremost, Denny was a family man who delighted in attending family reunions and learning as much as possible about his family history. He is survived by his wife, Kathleen; sister, Doreen Irwin of Elverta, CA; two daughters, Denise (Jason) Yohannan of La Grande, OR and Diane Voeller of Vancouver; a daughter-in-law, Charlotte Nibler of Vancouver; six grandchildren; and two great-grandchildren. Denny was preceded in death by his parents; son, Jeff; brother, Don; and grandson, Sean. Services will be held at St. Joseph Catholic Church in Vancouver on Mon., Dec. 11 at 9:30 a.m.. In lieu of flowers, the family requests that donations be made to St. Joseph Parish, the Society of St. Vincent de Paul or the Salvation Army.